Paul and I activated Mount Scott during the afternoon of 19th June 2015. We had packed up at Farina to head south once again. We had to wait for our camper to dry off and got underway mid-morning. After a brief stop at Copley for lunch we were soon on the road again. We had earlier arranged to meet Paul and Marija at Copley. 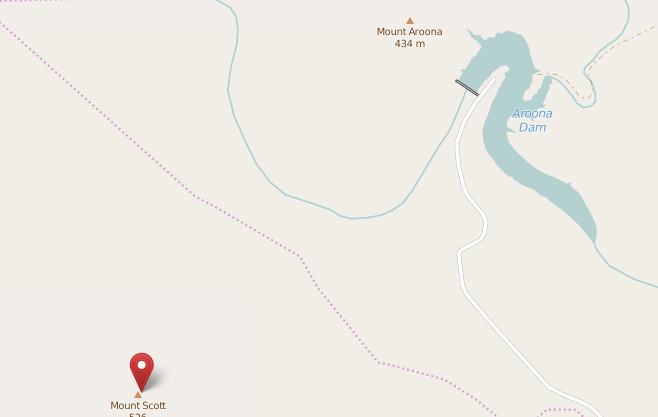 Paul and I had planned to activate Mount Scott, VK5/NE-111. I have examined a number of maps and Mount Scott is not shown. I can assure you, however, it is there! Mount Scott is the home of commercial radio installations and is visible from the Leigh Creek to Hawker Road. You would need to know where to look to spot it! The other members of our party visited Beltana Station while Paul and I were busy. Paul had previously gained permission from the land-owners to activate Mount Scott. He was told where to find the track. However, following the instructions given to Paul we found what appeared to be the track. We were not convinced. We spotted a 4×4 on a side road and we flagged him down. He was a local man who very obligingly showed us the track by taking us to the turn-off. We were not far off the mark! The track to the summit was about ten kilometres of intermediate grade and slippery in places. Paul did a great job in driving the track and avoiding the worst of the wash-outs, jagged rocks and slippery sections. However, I was very critical of the activation spot on top of an ant’s nest! Paul, sitting at his table avoided the worst of these landowners! I was walking around taking photos on Paul’s camera and video on my camera and this made a bad situation worse! Needless to say I picked up dead ants the next day from the floor of our camp and from my clothing! However, it was worth it. Mount Scott proved to be a great activation spot and we made some interesting contacts between us and also engaged in some band-hopping. My SOTA log is reproduced below. DX stations were worked on 20 metres: I5FLN, Luciano; RW3XZ, Alexei and on 15 metres I worked JA3BOA, Hideo. 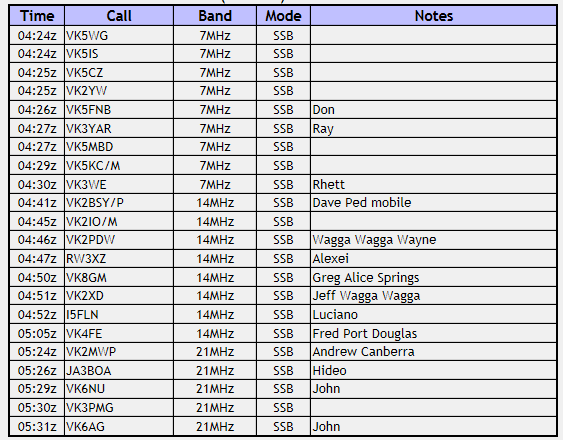 I was also pleased to work VK8GM on 20m and VK6NU and VK6AG on 15m. Propagation was fascinating. The two VK6 stations were 5 and 9 at the top of the cycle but deep fading made them inaudible at the bottom of the trough. It is only since arriving home that I have become aware of the solar disturbances late last week and early this week. There was no internet coverage away from the major centres.